- Construction: 1.6mm thick Stainless Steel Sheet Tank is continuously welded with Argon Gas Arc welding & mounted on 10cm dia. 4 heavy duty casters. Whirl-Pool bath made of heavy gauge stainless steel sheet is sturdily fabricated with bright finish inside. Dimension: 84" x 84" x 36" inch. Color: Black / Ivory Colour. 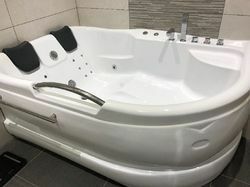 Lower leg effervescent bath with Kneipp tub: The massage effect and oxygenated cloud of effervescent bubbles reach up to the middle of the calf. The muscles in the feet and lower leg relax, the supply of fresh blood to the skin is improved. Waste products of the body metabolism are flushed out, oxygen and nutrients can be absorbed. We have in store for our customers Whirl-Pool bath, which are made of heavy gauge stainless steel sheet. These machines are sturdily fabricated with bright finish. 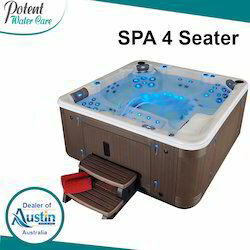 The unit is equipped with a turbine ejector and aerator is a spring motor turbo-lift, the digital temperature controller, indicator of sperm, and electrical resistance. Zoe creates the perfect setting for a rejuvenating bath with exquisite style and a bevy of convenient and intelligent features. So experience sensations you never have before.